LIFE can hit you hard when you least expect it — something that property developer Smart Niche Group’s (SNG) Datuk Simon David Leong Sai Mun and Datuk Dr Colin Lee know only too well. Leong’s father had a tyre and mining business but it collapsed during the recession in the 1980s. “Subsequently, my mum, literally, told me to fry kuay teow for a living. Because of that, I had no choice but to get a scholarship. I got myself two scholarships,” he recalls. The Kuantan boy began his career as a contractor and in 2003, he started Rivertree Group with construction as its core business. In 2009, the company diversified into property development “because construction is not a sustainable business and we cannot control our income”, explains Leong, who is group managing director of SNG. On March 5, Leong was named Emerging CEO of the Year by the American Leadership Development Association. Rivertree’s maiden project comprised seven bungalows in Setia Eco Park. The build-then-sell concept development started in 2008 and was completed in mid-2014. All the bungalows are sold. Leong says he took his time to develop the homes because he was waiting for the value of the land to appreciate to sell at higher prices. Lee, meanwhile, comes from a poor family with eight children and his father passed away when he was 16. With financial aid from a relative, he studied medicine in Sydney. Though he is a practising doctor, Lee, who is executive chairman of SNG, also helms Imaxland Sdn Bhd, which focuses on property development. He collaborated with Leong (as the contractor) to build Tropicana Medical Centre (TMC) in Kota Damasara from 2007 to 2009. Soon after TMC was listed as a flagship hospital by TMC Life Sciences Bhd, Lee sold his shares in it to venture into property development with Leong in 2011. Thus was SNG born. 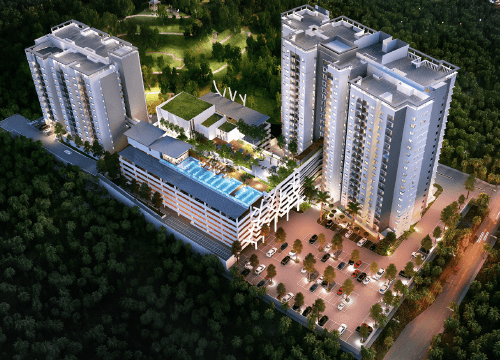 The joint venture’s maiden project is Sutera Pines in Sungai Long, Selangor. Sutera Pines is located in Jalan Palma Utama, beside the toll plaza of the Kajang Dispersal Link Expressway (SILK). The site caught the attention of the business partners when they were scouting around for land in the area to develop. Leong says, adding that he bought the land in 2011 from an Indian temple for RM26 psf. Sutera Pines offers 424 condos in two towers — 297 in the 20-storey Block A and 127 in the 12-storey Block B. With built-ups that range from 1,045 to 1,535 sq ft, the condos are going for RM470,000 to RM812,000. The project has a gross development value (GDV) of RM245 million and occupies 6.52 acres of freehold land, of which 1.5 acres have been set aside for a park. There will be 1,065 parking bays, of which 149 will be for public use. Facilities will include an infinity pool, gym, sun deck, children’s playground, squash court, badminton hall and surau. There will be 24-hour security with closed-circuit television cameras. Leong says the condos were soft launched last December and that Block B is fully sold. To date, 50% of Block A has been taken up. The official launch is scheduled for between May and June. On the ground floor of the towers, there will be eight shops to serve the residents of Sutera Pines and those living nearby. The shoplots — with a GDV of RM4.325 million and built-ups of 985 to 1,520 sq ft — are fully sold and were priced from RM540,000 to RM760,000. The owners signed an agreement with SNG that will allow it to manage the tenant mix. They also need SNG’s approval before renting out their shoplots. Thus, Leong expects to see two restaurants, a convenience store, an internet café, a launderette and a salon as tenants. He says construction work on Sutera Pines began in mid-January and it is slated for completion by end-2017. JLL Property Services (M) Sdn Bhd country head YY Lau says developments are gravitating towards the south of the Kuala Lumpur city centre, where it is becoming common for developers to build a mix of residential and commercial properties because they complement each other. She believes Sutera Pines’ success will depend on the number of owner-occupiers. “So often, we see properties snapped up by speculative investors and upon completion, these are left vacant for the opportunity to flip them,” she says, adding that the shops will see traffic once the residential component is substantially occupied. 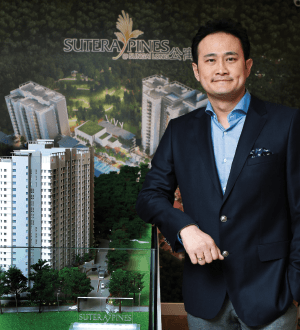 VPC Alliance (KL) Property Consultants Sdn Bhd managing director James Wong reckons that Sutera Pines will be successful. He points to the healthy take-up of new launches in Cheras, which is close to Sungai Long. Condos with similar built-ups in Cheras, such as Vina Versatile by Mitraland Cheras Sdn Bhd, were sold for RM490,000 in 2012, Wong says, adding that Sutera Pines’ lowest price of RM470,000 is affordable to the mass market in the Klang Valley. He observes that the proposed Kuala Lumpur Outer Ring Road that will connect Sungai Long to Rawang will be located about 5km from Sutera Pines, offering its residents easy accessibility to Ampang and KL. 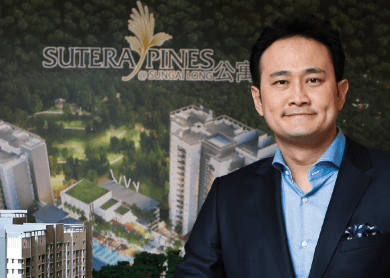 Wong also believes the shops in Sutera Pines will attract residents from the neighbouring Twin Palms by Lum Chang Holdings Ltd. Twin Palms is also located in Jalan Palma Utama. He says the shops will serve an estimated population of 4,100 from Sutera Pines and Twin Palms when both the projects are completed and occupied. His estimation is based on an average of four persons per household. Leong hints that SNG’s next development will incorporate an inter generational design and have a GDV of over RM1 billion. The project will be developed over five to six years, he says, but declines to reveal more because it is still in the planning stage. Besides Sutera Pines, Leong and Lee are also busy with the projects of their respective companies. Leong is planning a project called 20 Rivertree, which will feature 20 three-storey lifestyle shopoffices in Serdang and have a GDV of RM60 million. This will be followed by Rivertree Courtyard Homes in Puchong, Selangor. According to Leong, Lee’s Imaxland will be developing two boutique projects with a GDV of around RM100 million. One will be in Jalan Tun Razak and feature food and beverage and entertainment outlets. It will have a net lettable area of 124,000 sq ft. The other project offers eight semi-detached factories with a GDV of about RM64 million. It will be located in Kota Damansara, in close proximity to SEGi University Kota Damansara and TMC. “We won’t be acquiring too much land because it is very expensive. In a soft market, it takes up a lot of money,” Leong says, adding that SNG plans to develop residential properties in Brisbane, Australia, although there are no concrete details yet.